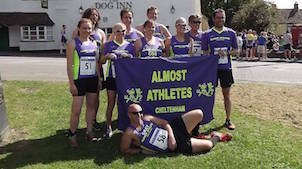 With a number of marathons just round the corner the Gloucester 20 was perfect for those in training. First home for the club was Chris Midgley, training for Edinburgh marathon he finished strongly in 2:21:22, Dale Midwinter had a good race and finished in 2:22:02. Dave McGrath led the club home in the Chedworth 10 mile. Jeanette Gullick and Paul Turner completed the Rhayader 5 mile. The new Blackminster Half Marathon proved very popular with Almost Athletes. Mark Willicott was first home for the club in 1:34 with Karen Galpin in hot pursuit finishing in 1:36. Personal best times were recorded for John Bailey 1:37, Dominic Lyes 1:44, Jeanette Gullick 1:50, Mark Lyes in 1:53 and Helen Fursman in 1:54.